Manorialism was the economic system in Europe during the Middle Ages. The word is derived from the word manor which here refers to a large estate (amount of land) controlled by a Lord and worked by peasants. Manors covered most of Europe during these times, providing for lords and their tenants. The lord of a castle also owned the manor. 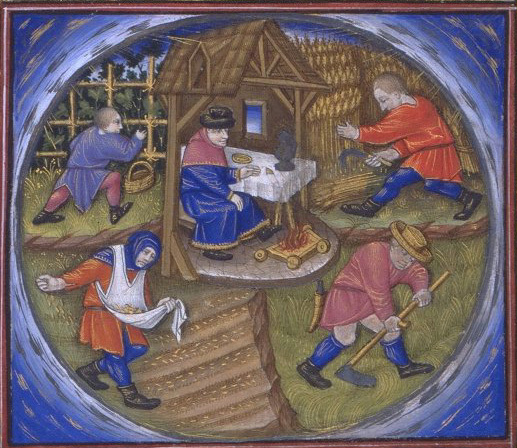 The peasants lived on and cultivated small plots of land on the manor as well as farming the lords personal land. They were "bound to the soil" -- they were not allowed to leave, and were considered a part of the property (they were not considered slaves as they would never be sold separately). In turn, the Lord provided government and the protection of the castle from outside forces.